As promised, Nasir’s 8th article from his back to basics series about transformers! This 8th article deals with dual voltage transformers and explores the 2 types of voltages at the output. If you want your works, testimonies, personal opinion, reviews or tutorials to be published in the blog, just send us a mail. A dual voltage transformer can be defined as the one which is capable of providing two types of voltages i.e. if the two separate windings are connected in series, they will provide the sum of voltages supplied to the two coils and if the two windings are connected in parallel, then the net voltage will be decreased. These voltages can be switched within the transformer according to the type of output required, just be using a dual voltage switch. Suppose we have a dual voltage transformer which has two windings connected in series at the input terminal and two other windings also connected in series at the output terminal at the place of the secondary coils. Then if each of the two primary windings are rated at 120 volts each, the total voltage at the input terminal will be equal to 120 V + 120 V = 240 Volts. Similarly, now if the primary and secondary coils are connected in parallel and each of the two primary windings are still rated 120 volts each then the total voltage at the input terminal would now be equal to 120 volts and 12 volts at the output terminal if it two parallel windings are rated at 12 volt each. In this way we can switch between two types of voltages by just switching the connections of the windings, which can easily be done by a switch as well. This reconnection saves the time and cost as well, as much of the power applications require a number of voltage levels for different machines, then in this case, using different types of transformers is not a solution. Just having a Transformer which has reconnect able windings greatly reduces the cost and the switch saves the time as well. Moreover, this type of transformer can be used in both the American and European countries, where the appliances and all the other electronics operate on a different voltage levels as supplied in those countries, then this transformer is of great use and can be used in both the countries with any inconvenience of changing connections or buying a new one, as all the connections are already made inside the device and offers a great deal of convenience, especially for industrial leaders, who have to use portable devices all over the world. Dual voltage transformers are quite easy to recognize as their voltage and power ratings are mentioned on them in a different manner as compare to usual transformers. 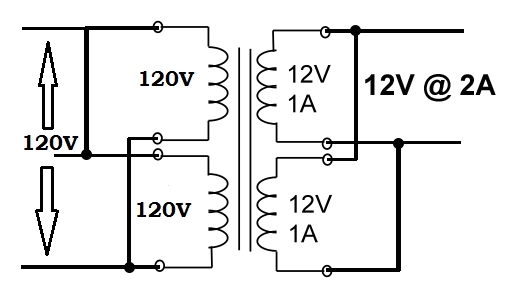 For example, if a simple transformer supplies 24 volts at 2 A, then it would be written like 24V @ 2 A. 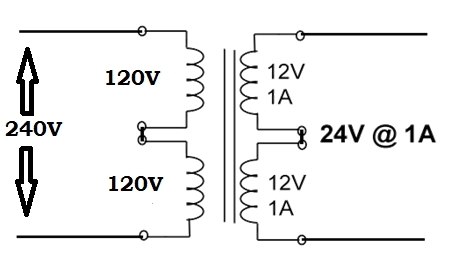 But since a dual voltage transformer can give us 12 V as well as 24 V, then it would be mentioned like 12 V – 24 V, from which it can be easily recognized that it this transformer can supply two types of voltages, although we have not seen its internal connections. In this way, they are really easy to identify, use and are getting quite versatile, especially in the industry nowadays. In the coming post we will discuss another type of transformer named as Autotransformer. We will discuss its design, working and applications in full details. or copy this trackback: http://engineering.electrical-equipment.org/electrical-distribution/dual-voltage-transformers.html/trackback from your own site. Spam protection: Sum of 4 + 5 ?